← South Africa apartheid lawsuit – The end of the epopee? It is inevitable that (international) human rights violations will occur when it comes to the dealing with the subject matter, particularly the non-refoulement principle. Therefore, the expulsion of immigrants has to be performed in a jurisprudential way, otherwise it may compromise rights such as the right to privacy; the right to expression; the right to a clean safe environment; family rights; citizenship; the right to access justice; the right to own property; the right to work; freedom of movement; right to food, water, education and many rights. It is submitted that this matter facing Tanzania is not only of national concern but also of concern to the entire region and it may even require intervention from the international community. It is legally doubtful if this term existed in Africa in the strict sense before the colonial regime. Africa has been one, save diversity in languages, but all in all most Africans would understand each other as they are Bantu people. The concept of “illegal immigration” owes its traits from the colonial “divide and rule” attitude that served the demands of capitalism. During this era, Africans were divided geographical with demarcations, for example, between the Luo ethnic group in Kenya and Tanzania, and the Maasai in Kenya and Tanzania. During independence, the legacy of divide and rule was inherited by the African leadership which failed to review them to suit the African context for the welfare of Africans. With the United Nations, African Union and other regional organisations such as East African Community failing to address this matter in its entirety, the time has come to resolving it because the trend has been that once these illegal immigrants are sent back by Tanzania to their respective nations, normally they come back after a short period. There is a need for a resettlement programme as legal means aimed at stopping this phenomenon continuously fail, further given that Africa is one and there exist strong ties amongst all Africans which include, but not limited to, inter-marriages and commercial transactions during pre-colonial and colonial era, independence, after independence and in the contemporary global world. From time immemorial Tanzania has been in the fore front of the fight for the decolonization of Africa and it is hoped that Tanzania will not refuse coming to the round table with Burundi, the Democratic Republic of Congo, Rwanda and Uganda for matters relating to illegal immigrants and old refugees who no longer want to go back to their home regardless of peace and stability in their nations and who would rather live in Tanzania. Good job youngboy. Hata mbuyu ulianza ka mchicha!! True, your piece is informative and educative to the authorities in Tanzania. You have said it all and it crystal clear! Let me contribute a little about the article, “Illegal immigrants now deserve the eye of law in Tanzania” Before going to the article, let me describe a word “immigrant”, this is a person who crosses the border of his/her origin country and goes to reside in another country. This one can go there maybe for looking better life, good job, good environment, etc.This is different from a refugee who crosses the border because hi/her life is in danger. According to International law, the primary obligation for the ones life security, is the country concerned (the country of origin). When the country of original has failed or unable to protect its people when their life are in danger, its when the International community intervenes. According to International refugees Law of 1959, no country or state is required to deport the refugees without their consent. Thus the principle of “Non refoulment” enters there. This principle prohibits any state to repatriate the refugees back to their home of origin without their consent, and any state which can violate this principle, it has to be denounced. Now, when it comes the issue of “illegal immigrants”, here it means we talk about those who are not refugees, but are immigrants who crossed their borders and go to live in another country, without following the procedures. 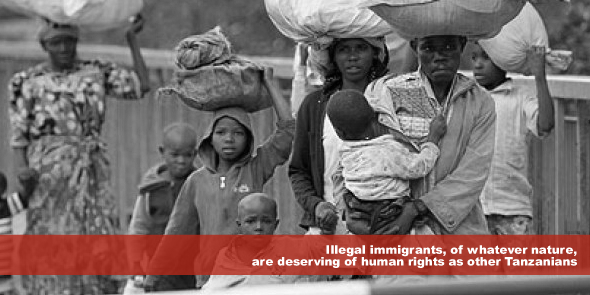 In another name we can call them, “illegals or undocumented immigrants.these are the people which not only Tanzania, but the whole world and the International law urge them to follow the procedure when they want to cross their borders. It is remembered that according to the Human Rights Laws, any one is free to live anywhere, but the procedures should be adhered. My advice, anyone, who wants to immigrate her/his country, should follow the procedure of immigration. From this perspective no, country also is allowed to violate the human rights to those illegal immigrants. Those illegals should be treated as human beings and be given all rights like the right to express themselves, rights to food, shelters, security, etc. But it should be noted also that to bring them before law and bring them back to their countries, is not the violation of human rights, but punishing them before being heard is the violation of human rights. Sasa ndg hajatueleza iwapo hao wahamiaji haramu huchapwa viboko au vipi. Kupelekwa mahakamani si uvunjaji wa sheria, but haki inaangaliwa iko wapi. I concour with your advice Mr. James Nzowa though this field of study is of not interest to me. U shauri mzuri sana kwa alieandika article ili akaiboreshe zaidi. Ni article nzuri sana. its true that illegal immigrants of whatever nature deserves human rights as any Tanzanians or any other human being in the world. Tanzanians also needs to enjoy their human rights in their country as it was previously when Tanzania was well known as a heaven of peace, illegal immigrants have now endangering our national defense and security. There is no doubt that Tanzania is no longer a heaven of peace as it was before,every where in Tanzania armed robbery, theft, killings,human trafficking, money laundering,drugs cartels,organized groups and sorts of terrorist attacks are the songs of the day. As any other sovereign state,Tanzania government is responsible for protecting its people and territory from external and internal enemy. the great lakes area is not safe, Tanzania citizens have to support the government initiatives which aims to restore peace and order for the benefits of all Tanzanians while observing human rights, otherwise we will not find anybody to blame.lets supports kimbunga. Off course Tanzanians also need to enjoy their human rights. the fact that there has been an increase in illegal activities in Tanzania owed ti illegal migrants does not make it right for us expelling every migrant in the country even though they possess relevant documents of their stay in the country. Better coordination could have been employed to conduct the campaign. We have seen it tearing families apart and even in many instances victimizing the Tanzanian themselves. What is being asked is that the Tanzania government should undertake the exercise of expelling illegal migrants with care so as not to victimize the people and worse enough violate their basic human rights. Remember everybody deserved to be respected of their human rights.